For motorcycling enthusiasts Thailand, and indeed neighbouring Laos, are famous worldwide for amazing scenery, great roads and fantastic sightseeing along the way. Above is a movie that gives you a taste of what is on offer, if you haven’t experienced it already. Below is a piece commissioned by the Tourist Authority of Thailand (TAT) that gives you a low-down on how tos, whys and wherefores for those who prefer their scenery experienced from the open air, rather than from the inside of a moving metal box. 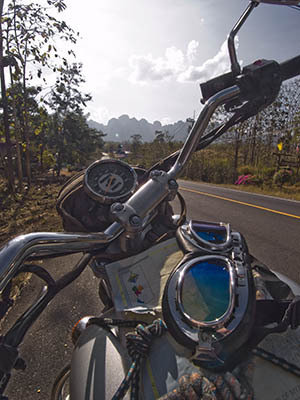 When it comes to motorcycle touring, Thailand ranks as one of the world’s great destinations. This is for the very simple reason that it has it all: craggy hills, forests, endless coastlines, unspoiled national parks, historic monuments, magnificent temples, modern cities, ancient ruins, diverse ethnicities, varied cultures, an advanced road network, accommodation to suit all budgets — and, of course, the hospitality and grace that really mark the kingdom out in the world.